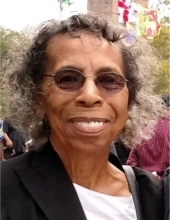 Bertha Ann Hill Epps was the oldest daughter born on May 20, 1932 to the late Curtis and Lovonia Hill of Burkeville, Virginia. She was preceded in death by her husband, James and four brothers – Joe, Harvey, Pete, and Will. She was baptized at an early age and became a member of the Gravel Hill Baptist Church. She was a member of the senior choir for many years as well as the hospitality committee until her health began to decline. On September 28, 1954 Bertha became the bride of James (Jimmy) Epps. Jimmy was a member of the US Army at the time so she was fortunate to travel with him to many different states as well as out of the country (Germany). They were blessed with two children, Robbie and Sharon. Bertha was known for her buttermilk coconut pies as some near and far frequently would ask “Where is Bert’s pie”? She shared her recipe with her granddaughter, Kara, who makes them just as awesome as her grandmother. Kara will carry on the legacy not only for the buttermilk coconut pies but also for her grandfather’s famous pancakes as well as she is the “cook” of the family. Nana, as she was affectionately called by all of her grandchildren, was a proud grandmother and great grandmother. She did all she could to spoil her grands be it to cook whatever they wanted or take them out to eat. Bertha had a friend for life, Mrs. Betty Booker. Until her health declined they spoke over the telephone almost every day. She spent many years working at Carbone Stackpole Components Company as a Group Leader where she gained many other friends. Christopher (Ashley), Brandon, Shawn, Symone, and Kara; great grandchildren Jamari, Shatya, DaSean “DJ”, Nilah, Sariah and Logan; brothers Calvin (Ina) and Herbert; sisters Edith (Mearl) and Lucy; special great nieces Cierra who came to visit her at least twice a week and Chelsie who always had to come see “Aunt Bertha” many times a day; many other nieces, nephews, and cousins. Also a special thank you to Isiah, Brittany, Symone, Kara, Vhondrena, Sue, Mearl, Otis, and Edith for your enduring caring and compassion. Funeral Services Friday, September 21, 2018 at 12:00 Noon at Gravel Hill Baptist Church, Jetersville. Interment Virginia Veterans Cemetery, Amelia. To plant a tree in memory of Bertha A. Epps, please visit our Tribute Store. "Email Address" would like to share the life celebration of Bertha A. Epps. Click on the "link" to go to share a favorite memory or leave a condolence message for the family.